With night­fall, a wind blew in over the sea, from the lands bey­ond the Khazar Sea and bey­ond the vast steppe of the north, from king­doms of forest and snow that Amram under­stood to be the hab­it­a­tions of witches and snow djinn and war­ri­or women who rose on the backs of bears and of giant deer. In the wind was a prom­ise only of ice, storm and advan­cing dark­ness, and Amram knelt on the north­ern slope of a strange moun­tain, far home home, drew his woolen cloak more tightly around his shoulders and knew in his heart that he would end his days in some winter king­dom, among wintry men. I’ve always been the kind of read­er (and, I hope, writer) who cares about style. We can debate wheth­er Chabon has style or not, but, for me, this is evid­ence that Chabon is work­ing hard on this crit­ic­al plane. Style isn’t sur­face. Style is sub­stance. I’m read­ing Clive James’ Cultural Amnesia: Notes in the Margin of My Time, a won­der­ful book. In the sec­tion on F. Scott Fitzgerald, he dis­cusses the proven­ance of style: its cadence, tone, timbre, volume. The face of the work. To what extent is the style of a writer the product of the styles she has been exposed to as a read­er? Is it some form of aver­age? Fitzgerald’s let­ters to his daugh­ter, in which he tries to explain how style is formed, only deep­en the mys­tery. For my part, I worry about the ped­es­tal upon which I’ve placed Hemingway. He seems just flat out bet­ter than every­one else and I can’t help but try to imit­ate him. After all, if you’re learn­ing some­thing, you should find the best teach­er and try to do what you think they’re telling you to do. I’m read­ing yet a third book. It’s a col­lec­tion of quotes from Hemingway about writ­ingProps to Gareth L Powell for let­ting me know about it via this blog post, which includes sev­er­al more volumes of interest to the writer.. Many of the quotes are drawn from cor­res­pond­ence. Those sent to Fitzgerald mix exas­per­a­tion, admir­a­tion and rage. Where did Fitzgerald get his style, and why did it desert him? Chabon is an extraordin­ar­ily tal­en­ted writer. I judged this book on its won­der­ful cov­er, both the green-and-gold cloth with its pic­ture of the two trav­el­lers at the shore of the Caspian, and the music in the prose. There has to be music. Thanks for the link, Ian. I’m glad you’re enjoy­ing the Hemingway book. Yes, it’s great. I’m ration­ing myself one or two quotes a day. 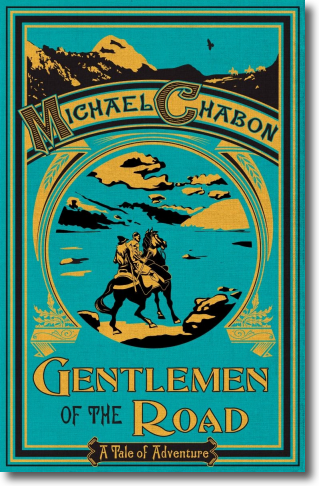 It’s a great cov­er, but my imme­di­ate instinct (if I hadn’t recog­nised Chabon’s name) would be to think that it was a spoof of some sort: think Ripping Yarns, or the Dangerous Book for Boys. You’re right, Tim. I thought it was a spoof too, at first, and might be amus­ing on that level. But the cov­er is lovely and tact­ile.